So we are about to start adjusting our half-scale standard pattern after client’s measurements in accordance with the calculations. We are using a half-scale pattern because you need to learn how to work with mock-ups. Whenever you decide to sew a complicated skirt or dress, you will first of all need to adjust the pattern after your client’s measurements (which is easier done in half the size) and then polish up its shape, sew a mock-up, make further adjustments, and start working on the full-size garment. And this is why we start from customizing a half-scale pattern. I have printed out the initial bell-shaped skirt pattern in half the size and prepared a piece of paper with all adjustment values calculated based on client’s measurements (half-scale dress-form measurements in our case). I have written down all values for the half-scale pattern and for the full-size pattern. I will first apply all adjustments to the front of the half-scale pattern and then repeat the same with the full-size pattern. Let me remind you our adjustment values calculated for the half-scale pattern. The total width of all dart openings is 5.5cm. The side dart has a width of 2.7cm. I need to mark 1.3cm left and right of the centre to draw it. The front dart has a width of 0.9cm, which means I need to mark 0.4cm left and right of the centre. We split the back dart in two darts. Each back dart has an opening with a width of 0.9cm. I will mark 0.4cm left and right of the centre of the first dart and 0.5cm left and right of the centre of the second dart to avoid losing part of the required width in the rounded area. 23.5cm + 0.5cm = 24cm. We have determined that there is no need in shifting the side seam line. Therefore, Waist Circumference, Stomach Circumference, and Hip Circumference will be divided exactly in half between the front and the back of the skirt. 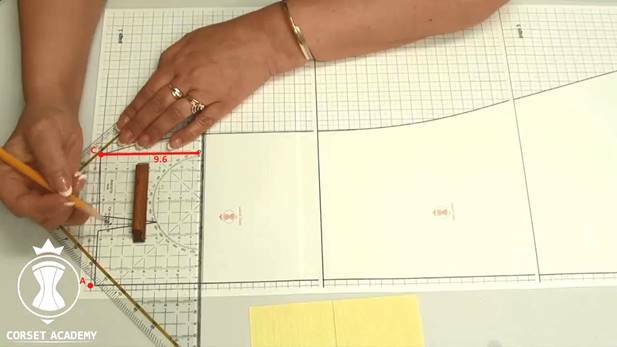 And now I will show you how to adjust the initial half-scale pattern of a half of the front after individual client’s measurements. I need to use 1/4 Waist, Stomach, and Hip Circumferences to adjust the half-scale front piece. My patterns always include seam allowances. I have been making them this way for many years and I believe it is a lot more convenient than adding seam allowances on fabric. There are 2cm seam allowances along all vertical edges and 1.2cm seam allowances along the top edge and the bottom edge of the full-size pattern. Seam allowances on the half-scale pattern are 1cm and 0.6cm correspondingly. One more thing I want to say before we start adjusting the initial pattern: I use this pattern or template for bell-shaped skirts, as well as for straight skirts. The only difference is the shape of the side seam. I need to draw a grid before adjusting the pattern. I do this by prolonging the midline of the front piece and drawing a perpendicular line through point C.
The resulting A-C line is the waistline of the skirt. I draw the hip line and the stomach line parallel to the waistline. Point B on the hip line marks the border of the grid. I draw a perpendicular to the hip line through point B. This perpendicular intersects with the stomach line in point G and with the waistline in point T.
We know that the side dart on the half-scale pattern has a width of 2.7cm. Therefore, I need to mark 1.3cm left and right of point T, i.e. onto the back and onto the front. I step 1.3cm from point T and mark point T1 on the waistline. It is the end point of the waistline. I connect points T1 and B with a straight line. This line (T1-B) intersects with the stomach line in point G1, i.e. it is the end point of the stomach line. The resulting Stomach Circumference is smaller than on the drawing when we don’t account for the added looseness. But, since we have added 2cm looseness along the hip line on the full-size skirt, it is logical to assume that there is a little looseness along the stomach line as well. I think it is fine! We will stick with the Stomach Circumference which we got when we were drawing the pattern, i.e. up to point G1. As the result, the new side seam line of the front will pass through point G1. There is one important condition: the side seam line must not be a concave line! Let us move to the front dart. The dart length makes 4.9cm on the half-scale pattern (seam allowance included), which corresponds with 9.8cm in the actual size. As for me, I like this length and I suggest we leave it unchanged on the adjusted pattern. 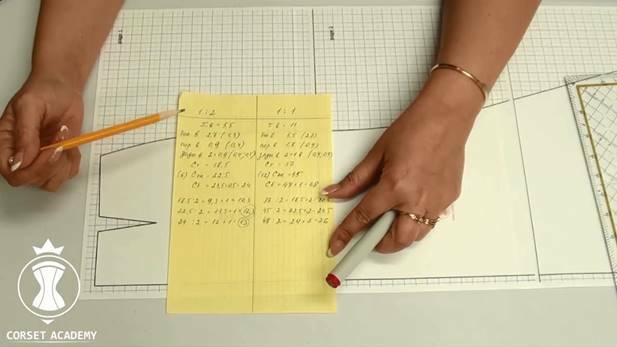 Our task is to draw a dart with the previously calculated width – 0.9cm for the half-scale pattern. I connect the end points of the front waistline – line T1-A1. Then, I mark point P in the middle of the line. In our case, the client’s figure is well-proportioned and there is no need in shifting the dart closer to the side seam line. And, therefore, point P situated in the middle of line T1-A1 is the centre of the front dart. I draw a perpendicular to T1-A1 through point P and mark down 4.9cm (P-P1), i.e. the length of the dart on the pattern. Then I mark 0.4cm left and right of point P (points P2 and P3) and connect these new points with the top point of the dart (P1). The last dart is ready. 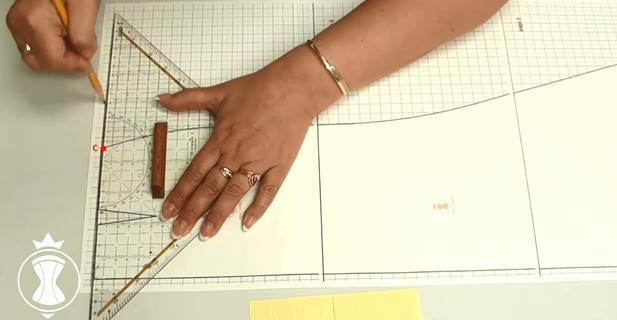 I measure the distance between point B and the initial side seam line of the pattern to see how far it needs to be shifted to adjust the pattern after my client’s measurements. The result is 1.2cm. I re-draw the front side seam line 1.2cm closer to the centre. 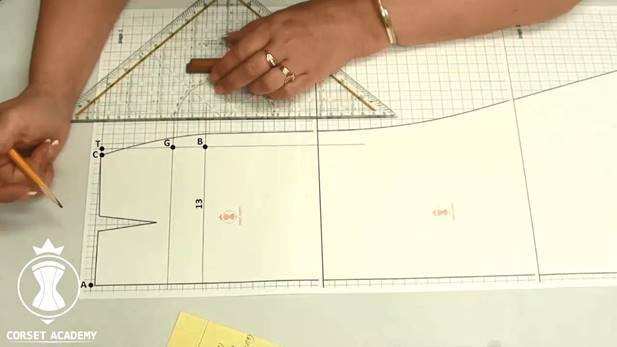 Remember to work on the bottom line when you start constructing a full-size pattern for a real woman of a certain height. I outline the new lines with a marker. You can make the side seam line a little rounder in the area between the hip line and the waistline. 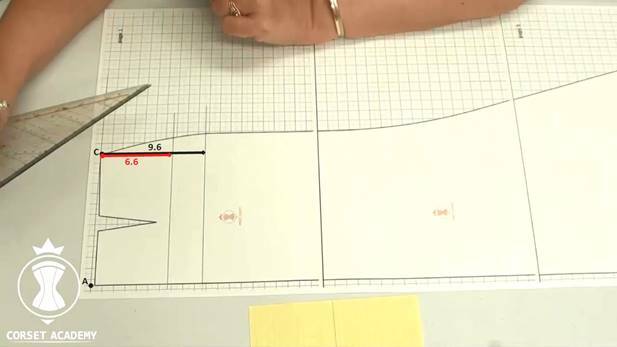 If you need to make a pattern of the front of a straight skirt, simply draw a perpendicular line right down from point B. The front of the skirt is finished and we can move to the back.